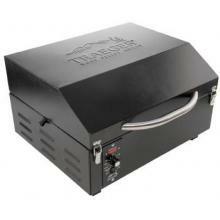 This portable barbecue smoker 22 from Smith & Wesson was marketed as the true “go anywhere” BBQ smoker. It looks like it falls into the generic “bullet” style unit that Weber and Brinkmann do so well however the big difference between this and any other that I’ve seen is that the 22 wasn't fueled by gas electricity or charcoal. Note: - Regrettably this smoker is no longer made however I'm keeping the summary live on the website so that we can compare and contrast with other portable smokers on the market. It was actually fueled directly by the wood pellets. The instructions asked for 2 pounds of wood pellets to be poured in and then ignited using a gel. Let it burn for about 10 to 15 minutes and then there would be a glowing coals on which to cook. I have a thing about gels, which inevitably are derived from a petroleum base and that is that they taint the flavor of the food. Frankly I can't see how this isn't going to happen. Also 2 lbs of wood chips is an awful lot. I can't see how this is going to be economical either. You've got to use the same quality of wood chips to provide the heat as well as the smoke and that's going to mean a considerable expense over and above charcoal. From the portability angle it weighs in at 18 pounds, I have known lighter but it’s still a reasonably easy lift although I wouldn’t want to carry it very far. I guess the idea of tailgate party or camping is the way to go. Overall though, the bottom line for me is why not just have a portable charcoal barbecue smoker and throw on a few wood chips for some extra flavour. A portable grill with a lid such as the Weber Go Anywhere or Smokey Joe offer a helluva difference in price, both are much lighter and and will do a similar job. At the end of the day the Smith & Wesson range of pellet barbecue smokers were manufactured and badged by Traeger so when it comes to a portable pellet grill it's hardly surprising that you have to look no further. My question however is whether the Traeger version is truly portable? Yes, it's a table top grill. But given that it needs a mains electrical connection to cook then that takes it out of the camp picnic / beach barbecue market. What makes this unit stand out is not just the WiFi connection that means you can control your cooking from your phone but that fact that you can run this little dude of 12V. 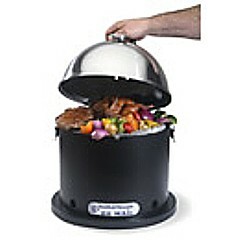 Take it wherever you like and you can plug it into your car cigarette lighter and start cooking. 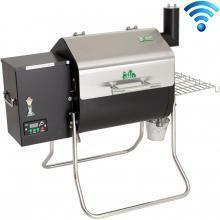 We haven't tested one but the reports we have so far are that they offer good even cooking coupled with the set and forget approach for which pellet feeds are renowned. 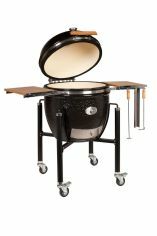 That said, when you're up in this price range (and me being a charcoal fan) I'd be looking at the PK Grill as a serious alternative for a portable barbecue smoker.